This quilt set is my favorite bedding EVER!! The colors of the feathers are true to the picture. It really brightens up the room without being overpowering or childish. The quilt is light enough for spring and works great with a cover for winter. Everything has washed well and held up to the kids & dogs finding their way into our room. I would buy this 100 times over! Add a fun, Western flair to your bedroom with this Dream Catcher quilt set. Featuring a wide variety of colorful feathers in red, crocus, blue, gold, teal, and gray on an ivory background, this colorful quilt set provides a stylish addition to any decor. The quilt reverses to a coordinate feather print on teal blue, providing two looks to match your style. I purchased this for my daughter's room. It's nice, quality material that will last. The 2 shams are standard. The underside of the quilt is a gray-teal color which is a nice contrast from the other side. The additional throw pillows are a nice addition, I think they might be feather filled. It is exactly what I had been looking for to change the decor in our guest bedroom. It is very hard to find Southwestern style bedding that is light & bright color wise. I have been searching everywhere for a long time and could only find dark patterns. Nice materials. The shipping packaging was HORRIBLE, it was all torn open and very flimsy and my stuff was falling out. I would expect more from Overstock. The quilt is smaller than I had anticipated especially since I've purchased other king quilts on Overstock. MAKE SURE TO MEASURE! It's not generous size. There is a sheen on the fabric, so it's not that "flat cotton quilt" feel. Maybe it will go away after washing. I really like the quilt! It's reversible which is so great for me , I like change! The quilt was plenty big for my king bed that is a huge plus , other quilts I've bought from other sites just barley fit. Thanks overstock for the promt delivery! Very cute, very soft cotton. Colors are accurately shown - nice cream background with dusty teal...has worn and washed well for over a year now...It looks great and a sort of bohemian style for my bedroom. Very happy with this quilt. The colors are what you see online. It's very pretty and fit the need I had for a room painted gold. I wanted to update the room without painting. Comfy cozy &amp; beautiful would recommend!!!! I bought the whole set and curtains and I love everything. Love the pattern and needed a change. "Where can I find the euro square pillows in the picture?" 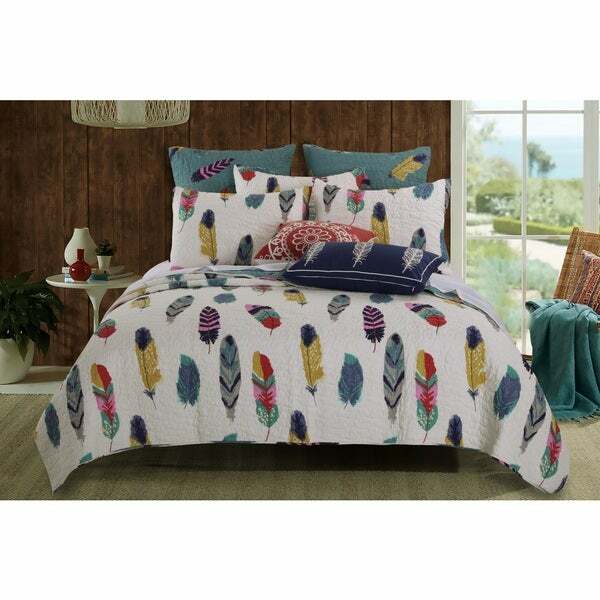 "I love this design, but saw on a customer review on another site that this quilt's feathers are not vertical as shown in this picture, but are horizontal. I don't want this quilt if it is this way. Can anyone verify the way the feathers run? Is it exactly as in the picture?"